Thomas Tryon. Surgical Dressings for War Relief, c. 1917. Lithograph. Buffalo, NY: Niagara Litho. Co. Library of Congress, LC-USZC4-9946. This volunteer group was among those that Greenwich residents joined between 1914 and 1917. Members fashioned bandages and other nursing supplies to be shipped to Allied nations. In a single year, the Greenwich chapter produced more than 37,000 dressings. 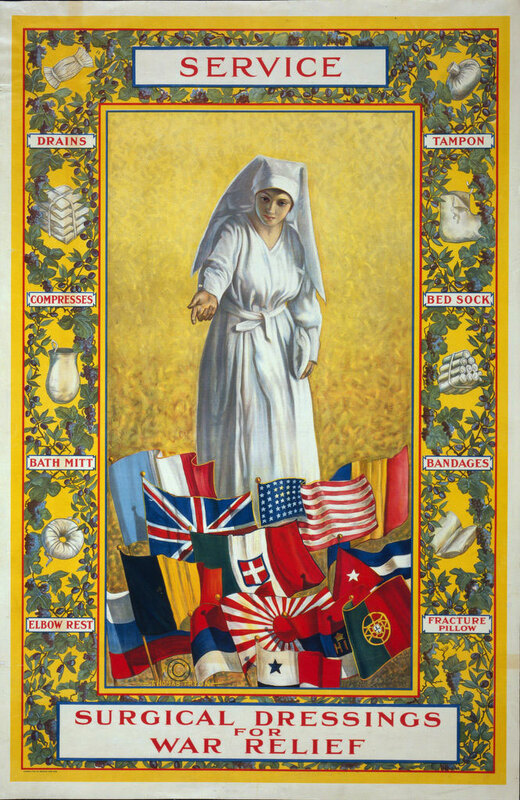 The organization became an auxiliary of the American Red Cross in 1917. Women founded and led many of these charities, demonstrating an assertive public role even before the United States entered the War.